As spring fills the world with life around us, it is with great joy that I welcome this class of freshmen to Keimyung University. To those returning to the campus this semester, I also wish to express my thanks in seeing you all again. Welcoming new students is one of the most important, joyous events at Keimyung University. Freshmen, your presence here today would not have been possible without your own ceaseless effort and the unwavering support you have received from your families, teachers, and friends. Be proud of yourselves, and be thankful for who you have had around you. Now that you have entered Keimyung campus, I encourage you to fully embrace the challenges of college life, to pursue your dreams, and to develop your boundless potential with passion and without fear of failure. This seminal year marks the 120th anniversary of our school’s foundation. Keimyung University began in 1899 with the establishment of Jejungwon, an institution for medical services and health education. The institution was founded by American missionaries with the aim of improving the health of the community and nurturing the Christian spirit. 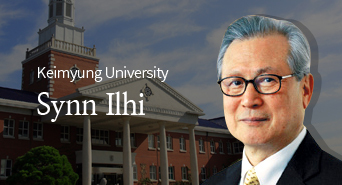 The founders’ pioneering vision, dedication and sacrifice laid the foundation for the philosophy of Keimyung University. We are proud that we have grown into one of the largest universities in Korea and are home to a state-of-the-art medical center, among other noteworthy centers and institutes. Last year, Keimyung University received the top rating from the education ministry in the university basic competence assessment. We also won a number of major government-sponsored projects. In addition, Keimyung’s hospital, Dongsan Medical Center, became the first hospital outside of the Seoul area to have successfully conducted heart transplants. Additionally, our hospital received the highest ratings in all four major areas of cancer treatment and conducted over 2,000 robotic surgeries. I am also proud of the outstanding performance of our students. Keimyung Orchestra has become the first college music group outside of Seoul to be invited to the Seoul Art Center’s university orchestra festival. Furthermore, one of our students received the Korea Talent Award. Many other students received awards and accolades, attesting to their excellence in academics, culture, and social services. Over winter and summer vacation, our students had the opportunity to volunteer on projects to improve education facilities and express gratitude to Korean War veterans in Ethiopia and Columbia, two of the 16 countries that sent troops to South Korea during the Korean War. The student volunteer program, which operates under the motto of “returning the aid that Korea received in its time of need,’ is now seen as playing an important diplomatic role in the international community. The students’ desire to lend their kindness and generosity to others gives me assurance that Keimyung’s teaching philosophy is taking root. The new semester will see dramatic changes in both the hardware and software of the school: a new dormitory is under construction and the curriculum is being restructured to incorporate interdisciplinary educational programs and encourage academic-industrial cooperation. We will never let ourselves become complacent with our current situation. We will continue to upgrade systems, infrastructure, and educational programs to always keep a step ahead of the waves of change that happen in education. I urge you to continue to encourage one another in all your endeavors, to teach students with sincerity and affection, and to do your best to fulfill your responsibilities. It is time to write the next 120 years of our glorious history. Keep in mind the “Keimyung spirit” our predecessors passed down to us. They created Keimyung University with their sacrifice, strong commitment, and blood, sweat, and tears. Once again, it is with great pleasure that I welcome this year's freshmen class, poised to take a big step forward in their lives. May God’s blessings be with you always.